On March 24, 2017, LLOPS is putting on our annual Professional Development Conference. This year’s conference will explore themes of effective communication from the unique perspectives of a new librarian who presents data to the masses, legal educators who collaborate with legal professionals in Afghanistan, and an expert on human-computer interaction and design. 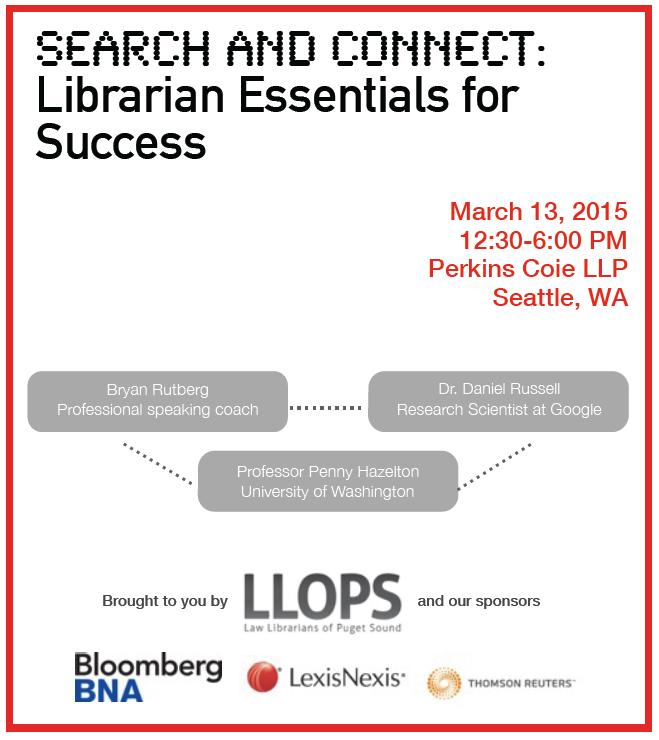 The conference will be held from 12:30 to 5:00 at Foster Pepper, PLLC. There will be a refreshment hour from 5:00 to 6:00. More information about the conference can be found in the LLOPS PDC 2017 Flyer. We have limited availability for this conference, and registration will close on March 17 so get your seat now! The Face of the Law—the LLOPS Spring Professional Development Conference, will be held on March 18, 2016 from 12:30 p.m. to 5:30 p.m. at Perkins Coie, LLP. Speakers will include Washington Senator Cyrus Habib and University of Washington Professor Ryan Calo. Senator Habib will speak on race, inclusion, and bias. Professor Calo will speak about researching robotics as a law professor. More details to follow. Please save the date! Nominations are due by February 1, 2016. For more information or to download the nomination form click here. If you have additional questions please feel free to call or email Sarah Mauldin, Emerging Leader Award Jury Chair, at 404-815-3538 or smauldin@sgrlaw.com. Professional Development Workshop – Save the Date! 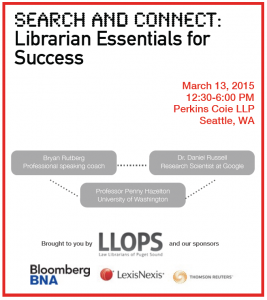 The LLOPS Professional Development Committee has been hard at work and we’re planning a half-day program for March 13, 2015 titled Search and Connect: Librarian Essentials for Success. We have two great speakers lined up, Dan Russell of Google and public speaking coach Bryan Rutberg, so mark your calendar and stay tuned for more information. Comments Off on Join a LLOPS Committee! LLOPS needs your help with committees for 2013-2014! Click below to view the committees that have openings. If you are interested or would like more information, please contact LLOPS President, Kim Ositis. Thank you to all of our wonderful members who are currently serving on committees. It is going to be a great year! At the February LLOPS meeting, Tina Ching, Sarah Griffith and I talked about our experiences with iPads in our organizations. At that meeting, I promised to post a list of the apps we discussed. With apologies for the delay, here it is. Fastcase – Access to state and federal cases and statutes via browsing, searching or citation. Requires registering for an account, but it’s free. Dragon Dictation – Easy-to-use voice recognition app that creates notes which can be edited, saved, emailed or copied into another application. LawStack – Access to court rules, including the Federal Rules of Civil Procedure, Federal Rules of Criminal Procedure, Federal Rules of Appellate Procedure, and Federal Rules of Evidence. WestlawNext – Close to the full functionality of WestlawNext via the web, but with an iPad-friendly interface. Requires a WestlawNext subscription. HeinOnline – Uses Hein’s vast collection of law review articles, ABA journals, CFRs and more. PDF content can be viewed within the app or opened in the iPad reader of your choice. Requires HeinOnline subscription. Evernote – A tool to save and organize websites, photos, lists, ideas, notes, etc. Synchs across all devices, mobile or desktop. iAnnotate – Read, annotate, organize and share PDF documents. Syncs with ITunes or Dropbox. Dropbox – Store photos and documents in the cloud for access via mobile and desktop devices. Lexis Advance – Run searches, Shepardize cases and add documents to synchronized folders. Lexis Advance subscription required. If you want to hear more about iPads and are attending AALL in Boston, I’ll be speaking at a Monday morning program called iCan! Empowering Librarians with iPads and Other Mobile Devices.